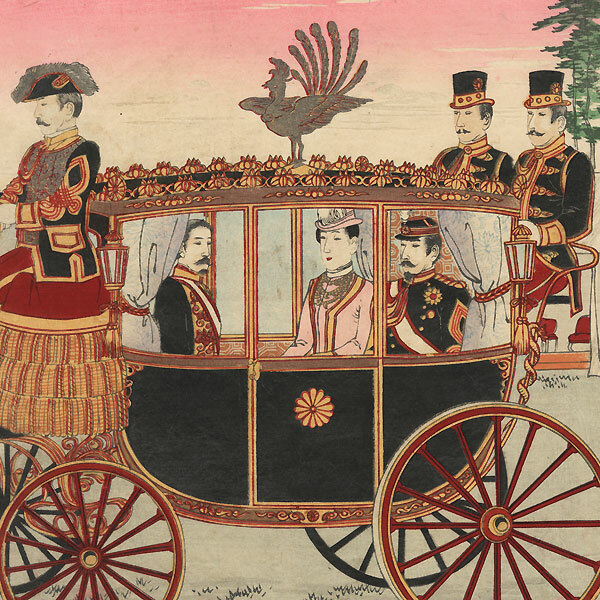 The Emperor Meiji and Empress in a Carriage during their Silver Wedding Anniversary Celebration at Aoyama, 1894 - Handsome scene of the Meiji Emperor and Empress riding in a carriage during their Silver Wedding Anniversary celebration at Aoyama. The Emperor wears a military uniform while his wife is dressed in the latest European fashions. 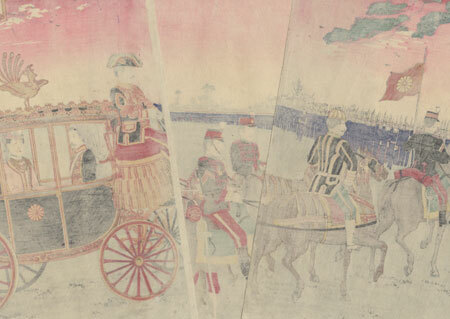 The elegant carriage is topped with a phoenix figure and is pulled by a team of six horse. Soldiers standing at attention line the parade grounds. A nicely detailed illustration of this historic event, detailed with burnishing on the black areas of the carriage and the black uniforms, and silver metallic pigment that has oxidized to a dark tone on the phoenix. Condition - This print with excellent color and detail as shown. Three separate panels. Slight toning and soiling, a few creases and stains. Please see photos for details.